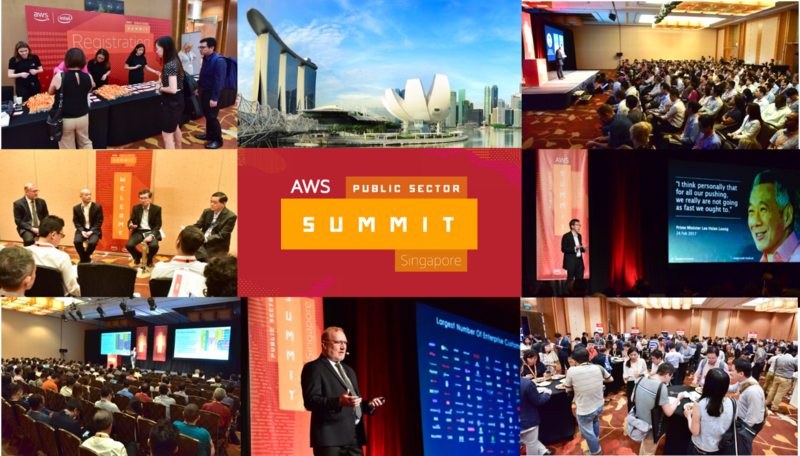 Earlier this month, we opened our doors to 700 technology and business leaders for the first-ever AWS Public Sector Summit in Singapore. If you couldn’t join us, watch some of the event highlights and read on to see what you missed. We hope you’ll make it next time. AWS Director of Worldwide Public Sector Marketing, Tricia Davis-Muffett, kicked off the keynote, preceding a lineup of presentations by AWS customers and experts. Headliners examined why the cloud matters to the public sector, the path to disruptive innovation in government IT, and other themes contributing to the uptick in public sector cloud usage. Other keynote speakers included: Peter Moore, Regional Managing Director, Worldwide Public Sector, Asia Pacific and Japan, AWS; Mark Schwartz, Enterprise Strategist, AWS; Tan Eng Pheng, Senior Director, Clusters Group, GovTech Singapore; Ng Siau Yong, Director, GeoSpatial and Data Division, Singapore Land Authority; and Swaine Chen, Senior Research Scientist, Genome Institute of Singapore. The Singapore central government technology organization, GovTech, shared its experience in developing the Content Website Platform – its first foray into delivering Singapore government agencies a scalable and secure web-hosting solution on the cloud. Using AWS has enabled GovTech to transform government website hosting and management, as well as the rapid deployment of services. This allowed the team to devote time and energy for digitalization and the realization of Singapore’s Smart Nation goals. Singapore Land Authority discussed how AWS, when coupled with geospatial intelligence, transforms and strengthens collaboration among communities driving disruptive innovation. This includes the creation and accessibility of public services such as food delivery and taxi bookings, as well as the adoption of geospatial analysis by government agencies to support the Smart Nation initiative. The Genome Institute of Singapore (GIS) positioned AWS as an economical tool for elastic computing, and as a flexible complement to advances in genomics hardware. This presentation explored the role of genomics in transforming healthcare, as well as GIS’s vision of a genomics-enabled future. An array of 19 breakout sessions followed, with learning opportunities from Management and Technical tracks. Topics spanned robotics, AI, big data, Internet of Things, security and compliance, adoption models, scientific computing, open data, and more. The Future of Research Computing on AWS – delivered by Adrian White, Sr. Technical Business Development Manager, AWS: The tools researchers use for scientific analysis and discovery are changing. AWS enables flexible, new architectures that users can mold to fit these evolving workflows. In this session, we explain how AWS customers are applying next-generation high performance computing, serverless architectures, and predictive analytics, in concert with machine learning, to do more with their research budgets and solve previously intractable research computing challenges. AI and Machine Learning – delivered by Olivier Klein, Emerging Technologies Solutions Architect, AWS: AWS offers a family of AI services that provides cloud-native machine learning and deep learning technologies, which enable developers to build an entirely new generation of apps that can see, hear, speak, understand, and interact with the real world. In this session, we took a look at Amazon Rekognition, Amazon Polly, and Amazon Lex. Watch the keynote and session videos on demand. Finally, attendees enjoyed a chance to network with partners and peers at an AWS-hosted cocktail hour, and gained direct access to AWS technologists to pose their most pressing cloud-related questions. Want to partake in an upcoming AWS Summit? Locate one in a city near you.